How about this for making motorcycling truly accessible to those with disabilities! ChrisTrikes is a company that offers kits to make a Harley Davidson, or any other motorcycle, adapted for a disabled user. I believe the company was founded by a guy who is himself handicapped after suffering Polio and uses an electric wheelchair. Guess he was determined to be able to hit the road on a Harley, despite his limited mobility! This kind of looks far sexier than riding around on an electric mobility scooter at 6 mph, however I guess the $15,000 for the conversion kit, plus the cost for your motorcycle, make this an expensive way to seek mobility kudos! ChrisTrikes offers three basic models, and get their real cowboy names: The Outrider, The Stagecoach and The Rustler. The Outrider is suitable for those who can transfer from a wheelchair onto a motorcycle seat, or for a wheelchair user to ride as a passenger. 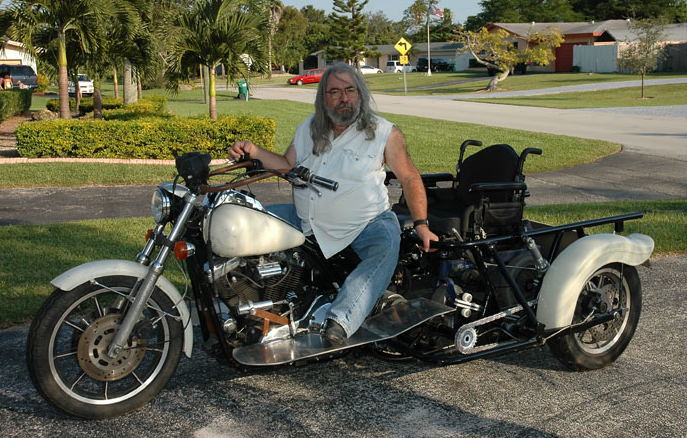 The Stagecoach enables you to drive the motorcycle from your wheelchair. The Rustler more geared towards able-bodied people, and without a wheelchair in the back, provides 25 sq ft for long road trips.